LOUD DISSENT: Argentines protest in Buenos Aires last week. Middle-class people worried about rising prices have sided with farmers in their dispute with the government over the tariff. Farmers fighting a grain tax find allies among the middle class, and the government turns to the poor for support. Political stability and economic growth are at risk. BUENOS AIRES -- An atmosphere of crisis and tumbling confidence has enveloped Argentina after five years of political stability and robust economic growth. President Cristina Fernandez de Kirchner is facing a rancorous farm revolt in one of the world's major grain- and beef-producing nations. Growers on Saturday ended their fourth strike this year, but the battle rages on more than 100 days after it erupted when the government imposed new tariffs on farmers selling grain abroad. Road closures, export shutdowns and a sense of looming calamity have replaced the relative calm and prosperity of recent years in Latin America's third-largest economy, after Brazil and Mexico.Scattered shortages of food and fuel have shaken consumers already anxious that rising prices and a looming energy crisis may signal a new downturn in Argentina's long history of boom-and-bust cycles. Both the farmers and the government have staged mass rallies as the president's approval ratings have plunged. The government has turned to its base among the urban poor for support, and the farmers have found unlikely allies: inflation-spooked middle-class Argentines who have hit the streets banging pots and honking horns in solidarity. Investors are jittery and Wall Street is warning of an economic slowdown -- even as neighboring Brazil and Chile ride export-powered booms. Amid soaring global commodity prices, vast quantities of Argentine soybeans, corn and wheat sit while ships waiting to transport grain to Asia and elsewhere float offshore, their holds empty. Growers rejecting the tariffs have held back grain in silos and used trucks and farm machinery to block trucks that transport foodstuffs to ports. The shutdown is adding to world food prices while costing the country billions and dismaying foreign buyers and investors. A nation of endless fertile pampas perfectly positioned to benefit from rising world food demand is instead at war with itself. "Argentina has lost a lot of opportunities because of this conflict," said Paulina Lescano, an economic analyst here. "With the strike, a lot of deals couldn't be made, and that generates a negative image of our country." Individuals fearing an economic collapse have been seeking shelter, buying foreign currency and squirreling money abroad. The ominous backdrop is the country's economic collapse of 2001 and 2002, when many lost their life savings. Argentina succumbed to a humiliating record debt default and went through five presidents in less than two weeks. Economists say such a free fall is unlikely now, as the central bank has healthy cash reserves and the economy continues to grow, albeit at a reduced rate. But many aren't waiting to be blindsided. Fabian Zabala, an accountant here, said he and his wife recently hastened to withdraw their savings and put the money into buying a new home. "In this country, one never knows what's going to happen," said Zabala, 41. "So to be sure, one has to hurry up and take action." Road closures by striking farmers and truck drivers have paralyzed vast stretches of the countryside. Amid global food shortages, Argentines have been appalled to see news footage of millions of liters of milk and tons of vegetables being dumped because blocked routes prevented them from making it to market. Reports have spread of arsonists targeting fields and stockpiled grain. "These 100 days have been very painful and carry countless negative consequences," said Fernando Iglesias, an opposition congressman. The conflict dates to March 11, when the president imposed a sliding-scale tax regime on farmers selling grain abroad. The major producers say they prefer to hold back their produce, even at the risk that it may spoil or they may lose sales, rather than pay duties they consider usurious. Under the decree, duties could jump by one-third or more on soybeans; Argentina is the world's No. 3 soy producer. Taxing farm exports has become a crucial revenue source for the government. Farmers have long decried the rates and this time said no mas. The tariff issue soon metastasized into something broader: a challenge to what critics call the authoritarian style of Fernandez and her husband and predecessor, Nestor Kirchner, both left-leaning populists. 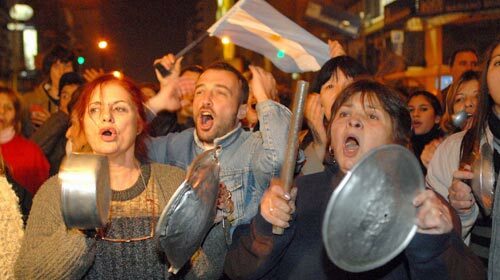 Middle-class urban Argentines who never stepped foot on a farm clanged casseroles on the streets to protest rising prices blamed on the Kirchners. The formidable alliance was born. Few Argentines seem to believe the official line that annual inflation is less than 10% -- a figure economists say probably understates the problem by half. Slightly more than six months into her tenure, Fernandez is a beleaguered figure who alternately calls for dialogue with farmers or lambastes them as greedy coup plotters. Polls show that her positive rating has sunk to the 20% range. She says she is seeking to save democracy, in place since the last military dictatorship ended 25 years ago, and shield the poor from coup-minded agricultural "oligarchs." The Kirchners have mobilized demonstrations among the working-class base that is the pillar of the Peronist movement that the husband-and-wife team now leads. Government supporters have blamed the farmers for rising prices. Critics have assailed Fernandez for emulating the kind of class-warfare rhetoric employed by Venezuelan President Hugo Chavez, a key financial backer of the Kirchners. Luis D'Elia, a pro-government union leader with a backing among the urban underclass, publicly cited the possibility of taking up arms and noted his "visceral hatred" for "the whites." The comment stunned many here, where most middle-income residents have European ancestry and talk of race is largely taboo. "No government since the return of democracy has done as much as the Kirchners to divide society," wrote Joaquin Morales Sola in the conservative daily La Nacion. Argentines wonder whether Fernandez or her husband, who stepped down last year to let her run for president, is really running the country. Analysts cite a "double command." The president has mimicked Evita Peron, the iconic late first lady still revered here. But few are shedding tears for Fernandez. Last week, the president sent the farm tariff scheme to Congress for debate, although the taxes have already been imposed and it is unlikely the ruling-party-dominated legislature will reverse course. How much either side will budge from entrenched positions remains a big question. "We're not destabilizers; we're not coup-mongers," said a farm leader, Eduardo Buzzi. "We're asking the president for more respect." Andres D'Alessandro in The Times' Buenos Aires Bureau contributed to this report.